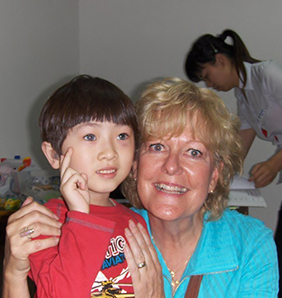 Denise Davis-Pedrie is a Speech/Language/Hearing Pathologist and Teacher of the Deaf/HOH with a specialist certification in Infant/Toddler Special Education. She is currently a Colorado Hearing Resource Coordinator with The Colorado School for the Deaf and the Blind supporting families with newly identified children, birth to 5 years old with hearing loss or hearing and vision loss. She has vast experience working with families and children birth to 5 in their homes and 20 years experience teaching preschool/kindergarten age children with hearing loss and normal hearing together. Denise has presented at various conferences including EHDI (Early Hearing, Detection and Intervention) and WREIC (Western Regional Early Intervention Conference ) on such subjects as Early Literacy Through Listening, Theory of the Mind and Hearing Loss and Positive Behavior Strategies with Children with Hearing Loss. She is a member on the Colorado Hands and Voices Board of Directors, which is an organization supporting parent-to-parent assistance with families with children with hearing loss. She is a native of Colorado and enjoys many outdoor activities, such as skiing, hiking, swimming and biking with her husband and friends. She also designs jewelry, knitting and sewing projects. All children want to connect with those around them. They are born with both the need and desire. As Specialists working with children with a variety of hearing levels, we are confident with the strategies for developing vocabulary and language content. But the development of pragmatics is more abstract. Pragmatics is the social use of language. It is the language that supports establishing positive relationships, managing emotions and navigating conversations in various contexts.